Leaving Santa Cookies? Try This Instead! Given the amount of treats at Christmas, Snack Girl is pitching a new way to engage kids in healthy eating. It all started with an e-mail that I sent Santa about what he wants for Christmas. Thank you for asking what I want for Christmas. You are very thoughtful. As you know, children leave me milk and cookies on every stop on my worldwide journey. In Pennsylvania alone, I will be confronted with 787,500,000 calories. This has been adding to my waistline and my belly (which used to feel like a bowl full of jelly) now feels like a tub of lard. Please ask your readers to leave me some healthy snacks. I read your blog and I'm sure you can give them some great suggestions. PS Can't fit that Porsche you asked for in the bag this year. How about a toaster oven? Christmas can be a "teachable moment". I would NEVER suggest not to bake holiday cookies, but why not add a healthy snack to Santa's treat? Go ahead and leave out cookies and milk, but leave out some carrot sticks or have kids make Ants on a Log. Santa will probably have a bite of the cookie, and then finish the healthy snack. He is SO great about leading by example. Of course, he is pretty threatening with that "naughty or nice" routine. I think this is SUCH a great idea! So funny that just yesterday I was talking to a friend about the obesity epidemic in America and how Santa is leading by example with his milk and cookies! If I had kids I would want to explain Santa's situation--that he's living off of milk and cookies which may give him tummy aches, make him feel yucky, etc. and then give them the choice of what kind of snack to leave! What a great idea! Given that my child is obsessed with nutrients, I may have him select a snack for Santa that is rich with healthy ingredients. i love these ideas, too! and here's another one coming from a different angle: make the holiday cookies smaller. i just bought the most adorable set of mini holiday cookie cutters from sur le table, and now i have delightful little gingerbread men, tiny candy canes, and little christmas tree lights. i also changed up the cookie recipe a bit, taking out the karo syrup and using lyle's syrup instead. another idea is to use whole wheat pastry flour rather than white and to cut down the sugar. finally, i have this whole bias now for homemade -- somehow if the treats are homemade, they are just better for me and my kids! but going smaller... and truly those cookie cutters couldn't be cuter. This is great! My almost 4yr old and I had a conversation just the other day about this. He wasn't eating his lunch and asked if santa eats lunch. 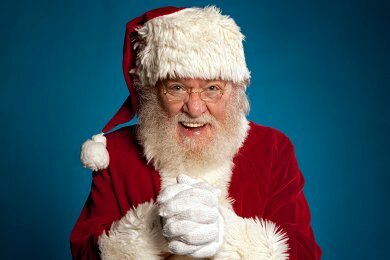 I told him yes, Mrs.claus has to make him a very healthy lunch full of protine because of all the millons of cookies he eats that night. He was quiet then says "santa must have a tredmill otherwise he wouldnt fit in his sleigh".